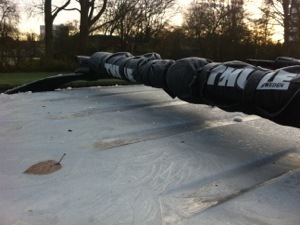 Frost covered the rooftops and grassy fields today. We joined our neighbors scraping the ice off our car windows so that we could see out before driving. April says its been raining in Sunnyvale and they don’t see it stopping anytime soon. Another connection I guess. She also shares the same opinion as my Dutch friends, that the weather really isn’t a problem, you just have to dress appropriately. I’m just not there yet – a bit of a slow adopter I guess. I didn’t grow up in Michigan or Minnesota or Chicago… I’m a California girl and am not used to being bundled up like a stay puff marshmallow man! Practice, practice, practice!! I’ll be there before the winter is over, I hope! Luckily someone else is watching out for me. Look what showed up in the mail today!! 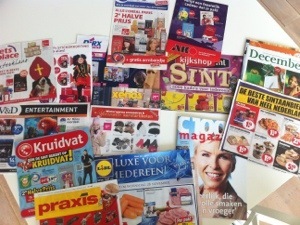 I thought you might like to see what Dutch ads look like. They come in the mail in a group like this and wrapped in plastic and are delivered every week. They don’t really tempt me because I can’t usually read them or I don’t know where the store actually is. 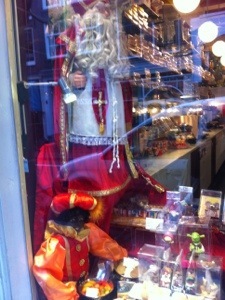 But I do like the Zwarte Pieten and Sinterklaas images that we wouldn’t see in the states. Shopping here is a very different experience for me. Instead of it being pleasurable, most of the time it feels like work. I think it’s because I don’t really know where to go, to find what I need and to be able to comparison shop. I haven’t found something like a TJ Maxx or Target or Costco, although Hanos is pretty cool. The language barrier doesn’t help either, but luckily most people are friendly and will offer help when I ask. I typically ask if they speak English first (in Dutch) and they most always answer me, with “yes – a little bit!” Isn’t that funny? I’m so thankful when they do, because when I do use a little bit of Dutch to ask a question and then they answer me in Dutch, most of the time I have no idea what the answer means!! Most places I go to shop I have to pay for parking and I hate that, just on principle. And the other part of shopping that I don’t like is that if you have to go to the bathroom, you have to pay for that too! And speaking of paying for things that should be free, most restaurants charge you for water and will not even offer you tap water. Now of course, there are plenty of exceptions to these, but I am confronted with at least one out of the three evils on most shopping occasions. I used to like shopping online, but here they charge you huge import fees. Jeff ordered a backpack for work and had to pay 10Euros to the delivery guy on the spot before they would give him his package. That was in addition to the shipping fees of course. Makes things pretty pricey! I didn’t intend for this post to be such a downer, but its kinda sounding like that and ending like that, but maybe the good news or the take away is that shopping shouldn’t be that important!!? But I need to shop to support our family! 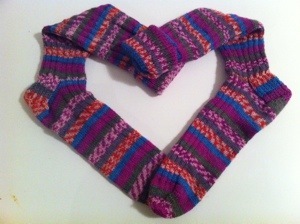 They need food and clothes to stay full and warm and dry, especially now when it’s supposed to freeze tomorrow! I’ll accept the challenge for what it is. Even if most stores close by 5 pm and are closed on Sundays! More time to be efficient and with family and friends, right?? Can you see the windmill in the background? 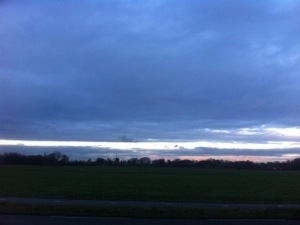 This view was from my car window while I was stopped at a traffic light, on my way to the Dutch version of Costco. I love the open fields, cows grazing, flowing canals, windmill and trees in the background, and a sky filled with a changing cloud skyscape. I never tire of this view. This path is near Ouderkerk Aan de Amstel, one of my favorite little towns in Holland. Hanos is the name of my new favorite store. It’s like a restaurant supply warehouse store, similar to Costco. They have great produce, meats, cheeses, wines, international food items, bakery items, decor, and general restaurant supplies. I love going there and imagining all the things I could make and bake. Today I was there to buy fresh rolls, deli meats and cheeses and some general items, as Gerard was coming over for lunch and Hanos opened at 7 am! The other lunch difference I noticed is that the Dutch enjoy eating an open faced sandwich. But then is it still called a sandwich? They have two slices of bread with butter spread on top, and one side is topped with one slice of cheese and the other side is topped with one or two slices of meat and maybe a tomato slice but the two shall never meet. They then cut the topped bread slices with a knife and fork. Interesting, right? My mom claims they taste better that way. She and my dad both joined Gerard eating this way, but I stuck to my normal. Coffee is served with every meal and in between. And after lunch, a dessert was served immediately. Fun, right? After lunch, Gerard took my parents with him to Schindel for a few days. I’m sure they’ll all enjoy each others’ company. We already miss them and “hate”sharing!! Just teasing… But Charlie did say at dinner tonight, “Mom, remember how we were waiting so long for Oma and Opa to get here and how excited we were and we couldn’t wait, and now we’re all sad because they’re about to leave?” He’s one smart and intuitive little one. Yep, Char – I know what you mean! Anticipation works both ways… Luckily they’re still here for awhile longer. 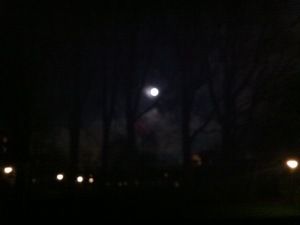 This is a view of the full moon tonight after a lunar eclipse. The sky was beautiful all morning and night. Patti Beth and I spent the day walking around the city… No real plan, just wandering and seeing where the roads and canals would take us. I like to call it wanderlust, I just wish I had a bit more sense of direction and ability to follow a digital map more than one step at a time. I definitely do not have visuospatial intelligence! Luckily getting lost was not a problem because that was the point! Funny how that works. Luckily we found the one shop we both wanted to find, along with several other treasures along the way. And who knew the one shop we both wanted to find was the same exact one!! Too funny. 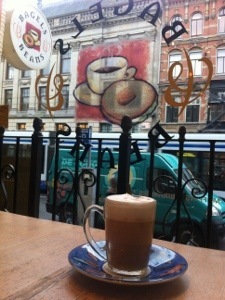 We stopped for coffee and a bagel at Bagel and Beans. I was so excited to have a bagel again, and it was so tasty, toasted with sesame seeds, melted goat cheese, bacon and roasted pine nuts. Are you drooling yet?? A little slice of heaven, and no calories?!? Here are a couple things that caught my eye today. 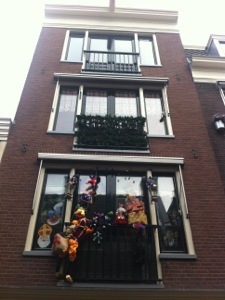 We saw a canal house front decorated for Sinter Klaas with Zwarte Pieten and gifts all over the place, just like we would decorate out front yards for Christmas, but in Amsterdam there usually aren’t front yards. 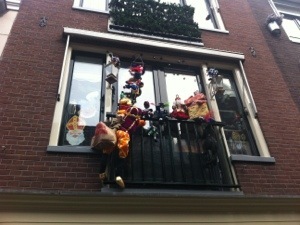 Most store windows have Zwarte Piet an Sinterklaas in the windows. 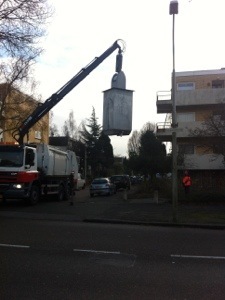 And definitely not festive but seen on my walk home from the tram, an interesting view of garbage pickup in Amstelveen!! Look how they do it here. People bring their trash to these bins from their apartments and then the garbage truck comes to one location and pulls the whole bin out of the ground. What do you think about that?? 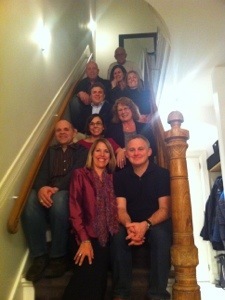 We had a wonderful evening out with family, Loes and Ton. 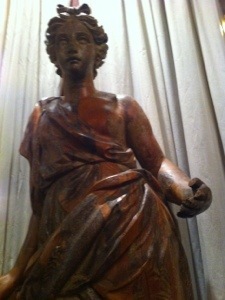 We met at their house in Amsterdam and drove over to the Arti Amicitae for dinner. Actually, 4 of us drove with Ton, and Loes rode her bike and beat us there. The place for dinner was so appropriate. The Arti Amicitae is a private club/ society that was established in 1839 to allow artists and friends of the arts to meet and share their passion. Today the club has 550 artists as members and twice that in art loving members. It’s a beautiful and historical building. I thought that it was special that they took us there as we first met at their house and admired the artwork from her family. Loes is a painter, her sister is a sculptor and artist and teaches the arts, her mom was a talented painter, and her daughter is a writer. We sat and shared stories from our life, and connections from our family history. 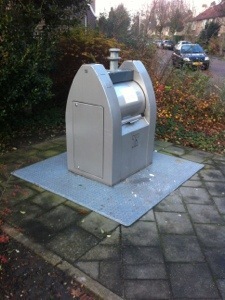 I’ll share just one connection – Loes’ mom’s father is my step-great Opa, who I always considered just my Great Opa. There was no distinction that we were not blood related. His name was Christiaan Maarsman and he died when I was pregnant with our first born child, who we named after Him. However, in America, we didn’t think the people could pronounce his name properly so we gave him a more American spelling and pronunciation and called him Christian. Loes’ Opa and my Great Opa was the sweetest man, and aged so gracefully and peacefully. I admired him so much and am thankful for this connection. We had not seen Loes and Ton in 14 years, yet we picked up where we left off. It is so nice to spend time with interesting people who are kind, passionate and generous! Thanks for dinner and the great conversation, friends!! Can’t wait to see you again. We left our Sunnyvale house 4 months ago today! We’ve been gone for a third of a year and have seen and done so much already. It’s strange to me to think that we packed up and resettled and adapted and redefined our life in just 4 months. When I was looking for something new to do with Jeff earlier this year, I had never envisioned this! I was hoping we could cook together or do a puzzle, you know, something interactive and a shared experience!! Well look what happens when you dream (big) a little! We are so lucky to have made the transition and we still like each other, and our kids don’t hate us (yet.). We’ve had many shared adventures already and so many more are still to come. 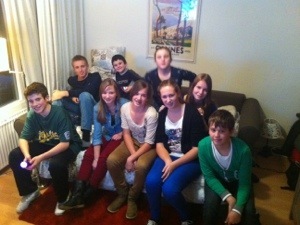 We’ve made some wonderful new friends and have enjoyed getting to know our Dutch family a little better. This is what I was hoping for back in January – I just didn’t know we’d have to move overseas to experience family togetherness like this. Tonight we hosted a family celebration with 21 of us for dinner. I still can’t believe that many people can fit in our house. It’s the second large dinner party we’ve hosted here and it was quite gezellig, meaning tight and cozy. My mom and I planned a menu and shopped and cleaned and cooked together – actually she did the cooking and I was the prep cook and cleanup helper! It’s so nice to have a wife again!! We make a good team. Franca so graciously brought the desserts that she made with her daughter. I love that this was a shared experience too. I love that we have family here in Holland and that everyone took the time to come together for a nice, Sunday family meal. A few families were missing due to other commitments, which is totally understandable. But it was nice to be together and to laugh and share stories and to just BE. Hope you had a great weekend and have a wonderful week. 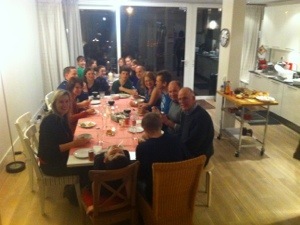 Tonight we celebrated Thanksgiving with some of our new friends in Holland, and with Mom and Dad. We all cooked and brought our dishes to Patty and Brian’s house, who graciously hosted all 20 of us. Tonight was really special and a great way to celebrate an American tradition in a new country. I actually enjoyed the work to make the delicious food and to be able to share it with loved ones. 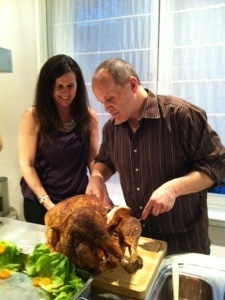 We all worked as a team, brining and baking, cooking and shopping and eating!! My friends are good cooks!! 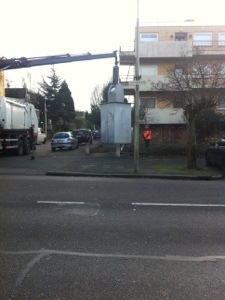 In Holland, refrigerators and ovens are really small. This made it a challenge for anyone to cook a large turkey. 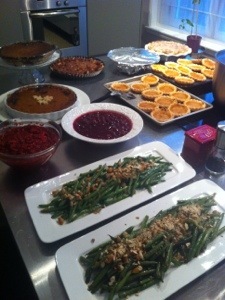 We are fortunate to have a larger than usual oven and fridge and were the lucky ones to cook the turkey. 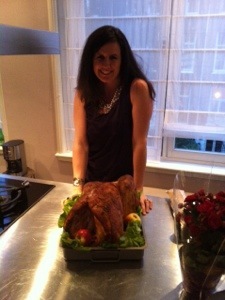 We purchased a 22 pound turkey that cost a 100 euros!! It hardly fit in any container and made brining, refrigerating, cooking, presenting and transporting quite a challenge. But luckily today, it was all possible. Dinner was really delicious. Everyone put so much effort into making home made dishes, that tasted so savory. I think we all went back for seconds!! Desserts were filling too and no one went home hungry. 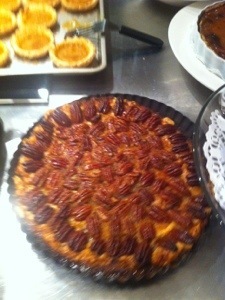 There was chocolate cream pie, pumpkin pie, pumpkin tartlets, pecan pie, apple crumble and vanilla ice cream. I think there was more than plenty! I think tryptophan took over my body here!! Good night!! I hope y’all are enjoying your holiday weekend, wherever you may be.